The Elderberry Hair Smoothie works with potent antioxidants and nourishing oils and butters to revitalize and soften your hair. The cream intensely conditions and nourishes the scalp and dry, brittle, or chemically treated hair. 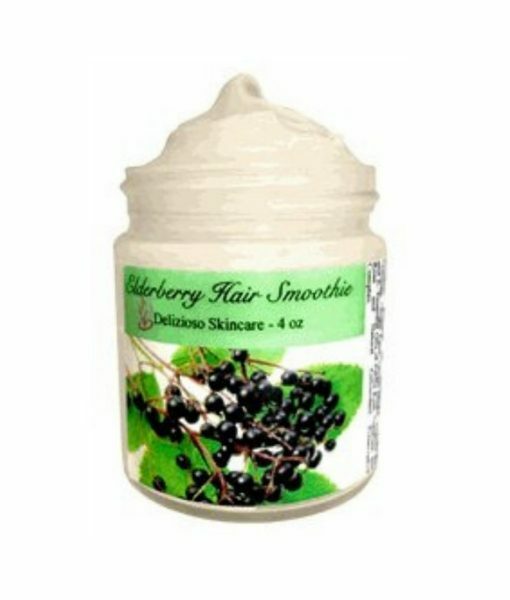 With loads of elements that smooth and hydrate the hair and the scalp, the elderberry smoothie is designed to carefully hydrate and revive hair that has been damaged or that is thinning. Best results after prolonged use. (* = Certified Organic) *Aloe Barbadensis Leaf Juice, Sambucus nigra (Elderberry) Extract, **Butyrospermum parkii (Shea) Butter, Prunus armeniaca (Apricot) Kernel Wax, Adansonia digitata (Baobab) Seed Oil, Perilla ocymoides (Perilla) Seed Oil,, *Sunflower oil, *Citrus Medica Limonum (Lemon) Extract, *Saccharum Officinarum (Sugar Cane) Extract, *Acer Saccharinum (Sugar Maple) Extract, *Vaccinium Myrtillus (Bilberry) Extract, Non GMO Tocopherol (Vitamin E), ProVitamin B5, Cymbopogon martinii (Palma Rosa) Essential Oil, *Melissa officinalis (Lemon Balm) Essential Oil, Rosa damascena (Rose) Essential Oil and Natural Antioxidant Preservative Complex. I agree with the prior review that this smells nothing short of amazing. Like, I don’t even know how they got it to smell so good! But the results are the true magic! I put this on the ends of my long hair before a run. Lately I’ve been having to braid my hair to avoid tangles and knots after a jog. Just using one dime-sized amount of this product caused my hair to 1) not tangle and 2) it actually still conditioned and kept my hair smooth in my shower. I would have to use two quarter-size amounts of other conditioners! My only concern is sunflower oil has been an irritant for my facial skin, so I just need to be careful that this doesn’t break out my back. Love it!